Colours like numbers and letters also carry a vibration or energy. When we open our wardrobe each day to choose clothes to wear it is often our mood which helps us select a certain colour of shirt or sweater. Ask yourself why most businessmen wear black or navy suits with crisp white shirts? Why is a red dress associated with a temptress or white with a wedding dress and innocence? Without thinking about it colour creates mood changes within us. We associate certain things with certain colours. Colour Therapists understand the importance of maintaining a healthy balance of the full colour spectrum in our energy field in order to remain healthy in mind, body and spirit. We all come into the world with our own Signature Colour and will gravitate towards others who resonate with and complement it. Likewise we will be repelled by those whose colours clash with ours. The signature colours I talk of here are not so much the colours that are seen but are those of our Energy Field or Aura. Even though we have a particular Signature Colour that remains with us throughout our life, we also radiate other colours depending on our moods or behaviour. When we are angry our aura will be awash with a dull murky red. When we are experiencing jealousy or envy we will display a dirty yellowy green. When in love, much pink and pastel colours will abound. When we are expressing ourselves or talking about something we are passionate about, bright yellow will stream forth. When we are developing spiritually or psychically we may display more indigo or violet in our aura. We may go through phases in our life when a certain colour dominates. This may be influenced by fashion or feelings. However, regardless of what phase we are in, our Signature or Core Soul Colour still remains the same. The colours that we display in our aura, wear on our bodies, decorate our houses with and even choose our flowers because of, can tell us much about our personality and our current state of mind and emotions. Colours in the Tarot Cards can give us further information and build on the imagery presented. If a certain Colour is predominant then the energy associated with this colour is bound to be influencing the Querant. When we start our journey through the Four Suits of the Tarot you will notice that each Suit has certain predominant colours. These colours reflect their Elemental Energies and give us a mood or atmosphere to accompany the card. 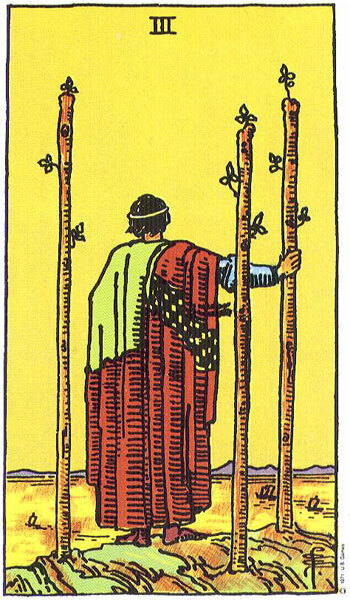 For instance the Suit of Wands reflect the colours of Fire (Orange, Red & Yellow). These colours are cheerful and warm. 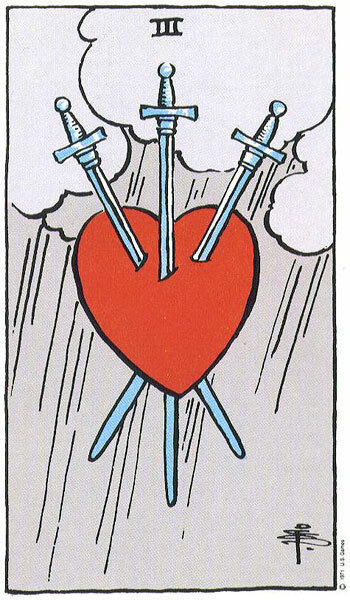 They bring liveliness to a reading while the Suit of Swords reflect the colours of Air (Pale Blues & Pale to Dark Grey). These colours can make us feel chilled, down and dark. One Wand Card appearing in a spread of Swords would bring much-needed light and gaiety to an otherwise drab and stressful scenario. On the other hand, a Sword Card appearing in the middle of a Wands spread may be enough to bring dark clouds into and otherwise sunny and warm day. It might be compared to the argumentative guest who ruins an otherwise great dinner party. You can play around with these comparisons as we proceed through the Four Suits. Take a look at the two cards below, The 3 of Wands and the 3 of Swords. Compare the colours of both. What feelings do the colours stir up in you? Colour Healing and Aura Reading can tell us many things about our personality, our strengths, weaknesses, our health and even our Soul Purpose. Studying colours and their effect on human emotions and behaviour will greatly assist in your readings. Extra reading on this subject is recommended to those of you who wish to learn more about this interesting and useful area of study. It is also possible to take simple online courses in this subject.